When it comes to grilling sausages for that family barbecue, company picnic or any other grilling get-together, bratwurst is king. These German pork sausages are juicy, flavorful and come in many varieties from spicy to cheese-filled. You can cook brats in a variety of ways, the easiest being simmered in a pan or broiled for a few minutes. Although it takes a little longer, simmering the brats in beer and finishing them on the grill is another easy way to prepare them, particularly popular in Wisconsin, the unofficial capital of brat sausages. Coat the bottom of a skillet with cooking spray or vegetable oil and place over medium-high heat on your stove. Add the uncooked brats and brown for five minutes, turning them frequently to brown all sides. Reduce the heat to medium-low and and add water to cover the brats halfway. Cover the skillet and let the brats simmer for roughly 10 to 12 minutes, until they are cooked through to at least 160 degrees Fahrenheit. Turn your oven to broil and set an oven rack about 8 inches below the broiler. Place the brats on a a broiler pan or wire rack sitting on a foil-lined baking pan. Broil the brats for 10 to 12 minutes, turning the sausages every few minutes, until they are fully browned and cooked through to 160 F.
Fill a large saucepan about three-fourths of the way up with your favorite beer. Beer adds flavor to the brats, but you can also use chicken stock. Add sliced onions for more flavor as well. Add the brats to the beer and simmer over low heat for 15 to 20 minutes. Pre-heat your grill at medium heat while the brats are simmering. Cook the brats on the hot grill over direct heat for about 10 minutes, turning them frequently, until they are browned and crisp to your liking. Serve the brats hot off the grill. Serve your brats Wisconsin-style, on brat buns, which resemble hot dog buns but are larger and chewier, with braised or raw onions, grainy brown mustard, pickles and sauerkraut. What Goes Well With Brats? 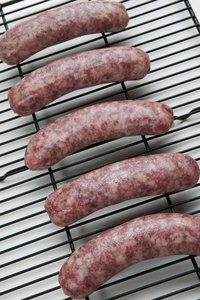 What Is the Difference Between Bratwurst & Metts?